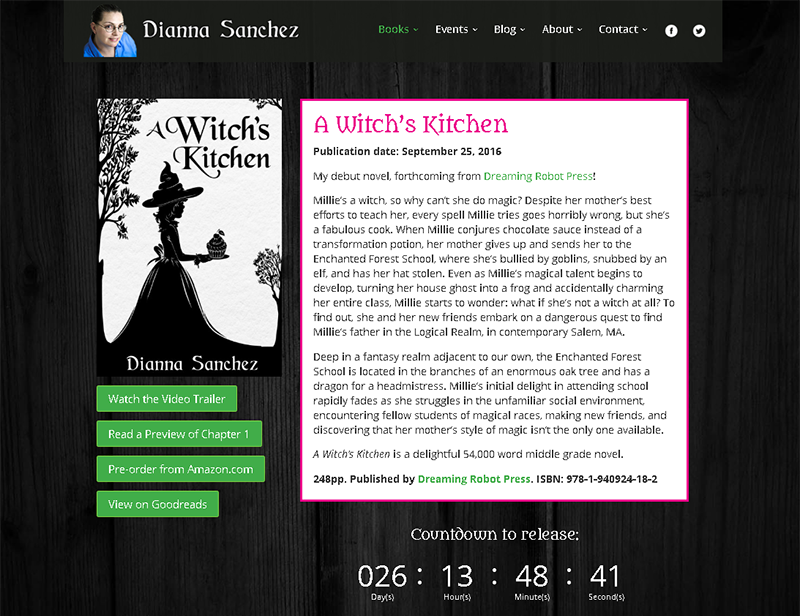 On Friday, I officially launched my latest website project: an author website for children’s book author Dianna Sanchez, whose debut novel A Witch’s Kitchen is forthcoming in a month from indie YA publisher Dreaming Robot Press. Check out the site! Backstory: Two months ago, I put out a call to the Universe (via Facebook) for some freelance work. Among the respondents (and there were a few, thank you, Universe) was an old friend from my MIT circles who needed a spiffy new website to go with her first book’s upcoming publication. She had set up a starter website back in April, in WordPress, but it was… rudimentary. (I’d say “basic” but that word has acquired problematic cultural overtones in the last ~5 years.) I never took a screenshot of it, but now I wish I had for posterity, because like most people I love before-and-after stories! Besides an advance reader’s copy of AWK (which I opened to read the first page, and suddenly I had read 30 pages; it’s really delightful), she sent me some samples of author websites she particularly liked — and, helpfully, the specific elements she liked about them. 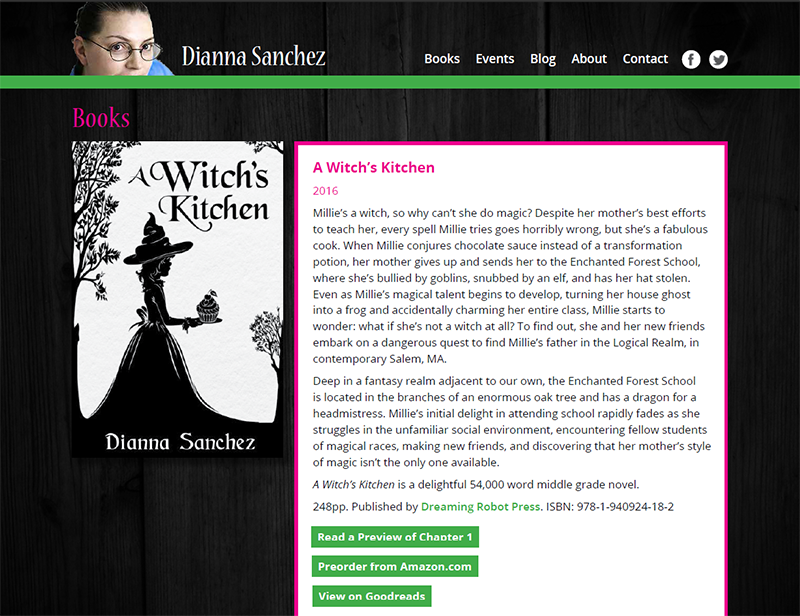 Between those two things, I got a mental image of what I thought her dream website might look like, so I did a mockup in InDesign and sent it over. Normally I try to present two different design concepts, but this time I had a pretty strong vision, so I thought we’d just refine from there. Great! … Now, how to build it? Especially in WordPress (which has many strengths, but flexibility is not necessarily high on the list)? I am a fan of WordPress, and I’ve had some practice customizing themes, but I wasn’t sure how to go about achieving the layouts I had in mind for the various pages. Happily, a little research turned up the Divi theme and associated Divi Builder plugin produced by Elegant Themes. I was a little apprehensive about investing in the tool (or rather the subscription to access the tool)… but they have a 30-day money-back guarantee, and you can use the tools and themes indefinitely — on unlimited client sites — once you’ve downloaded them. 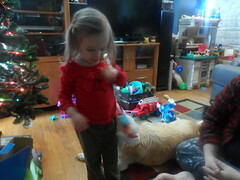 And I can now safely say it made this project about 90% easier, so it was well worth it in the end. I’ve since read complaints that “Divi sites all look the same”, but I think this site is proof that it doesn’t have to be that way. The author requested a few small tweaks up front to my design concept, and I made a few more over the course of actually getting it built, but substantially, the initial design is what we brought to life. This launch is really just the first phase of the website. The second phase (including the originally planned interactive homepage) will come in September in time for the actual book release. In the meantime, you can sample Chapter One on the DRP website.